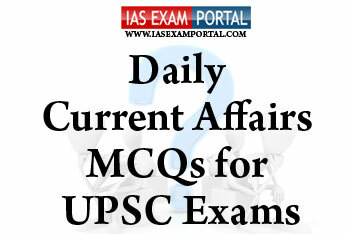 Current Affairs MCQ for UPSC Exams - 14 JANUARY 2019 | IAS EXAM PORTAL - India's Largest Community for UPSC Exam Aspirants. 1) NCEF is a fund created in 2010-11 using clean energy cess for funding research and innovative projects in clean energy technologies of public sector or private sector entities, upto the extent of 40% of the total project cost. 2) The fund is deigned as a non lapsable fund under the consolidated fund of India. 3) Projects which are being funded by any other arm of the Government of India or have received grants from any other national/international body will be ineligible for applying/funding under NCEF. Q3. Which of the following statements with respect to ordinance making power of the President are true ? 1) The President can only promulgate an Ordinance when either of the two Houses of Parliament is not in session. 2) The President cannot promulgate an Ordinance unless he is satisfied that there are circumstances that require taking ‘immediate action. 3) The Supreme Court, in Krishna Kumar Singh’s case, has reiterated the principle that re-promulgation of ordinances is a fraud on the Constitution and a subversion of the democratic legislative processes. 1) The Union Ministry of Minority Affairs is organising Hunar Haat under Upgrading the Skills & Training in Traditional Arts/Crafts for Development (USTTAD) scheme at different parts of country. 2) It has become successful mission to provide employment and employment opportunities and national as well international markets for thousands of master artisans, craftsmen and culinary experts. 3) “Hunar Haat” has become a “credible brand” to fulfil Nation’s commitment to “Make in India”, “Stand up India” and “Start up India”.